Created a new sandwich, which is melted cheese and strawberry jam, and ate a few of them. We will either call it the Kyle special or the cheesy damn jam sandwich. And Hayden had a good time too. Hope you had a nice 4th of July. Kyle and Grandpa posing with the first fish Kyle ever caught. Not too shabby for his first time and a pretty awesome picture if I must say so myself. I had to include a picture of Kirby because he was Kyle's best buddy the whole time we were up there. 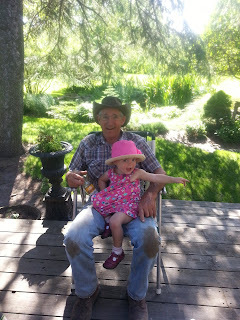 Little Miss Hayden sitting on Grandpa's lap and telling me where all the beer is located. Kyle taking his sister for a ride. Also one of the few times where they were both fully clothed. Captain Underpants striking his All-American pose. A bucket full of Hayden. 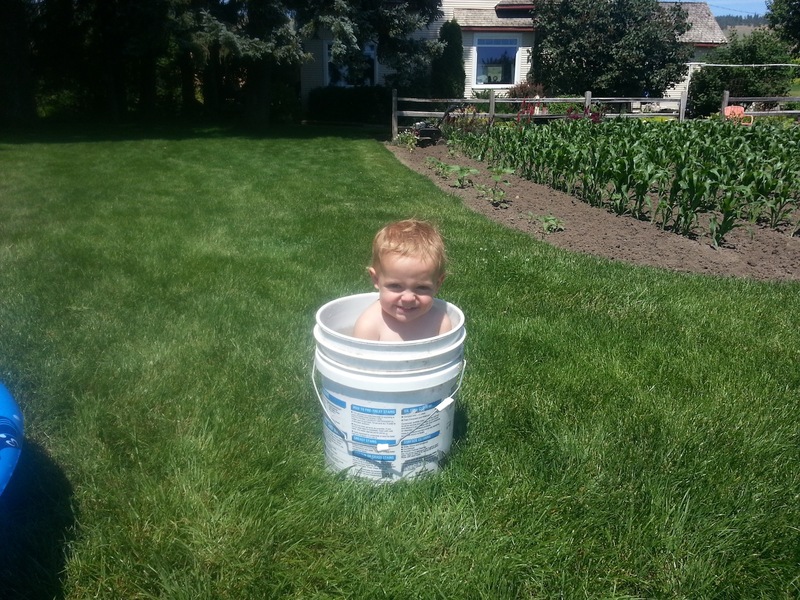 She enjoyed soaking in a five-gallon bucket when she was not in the pool. 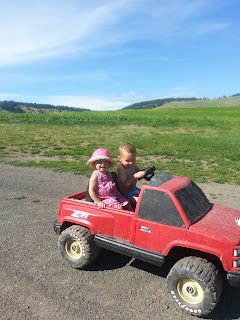 This looks pretty much like what my grandsons do at our house. And they don't wear clothes all the time either. I wonder who had more fun? The kids or the grandfolks? That truck looks cool. Must be exciting for him to go fishing for the first time. I remember my sons went fishing for the first time, my younger son came home and could not stop talking about how many fishes he had caught and how he did it. 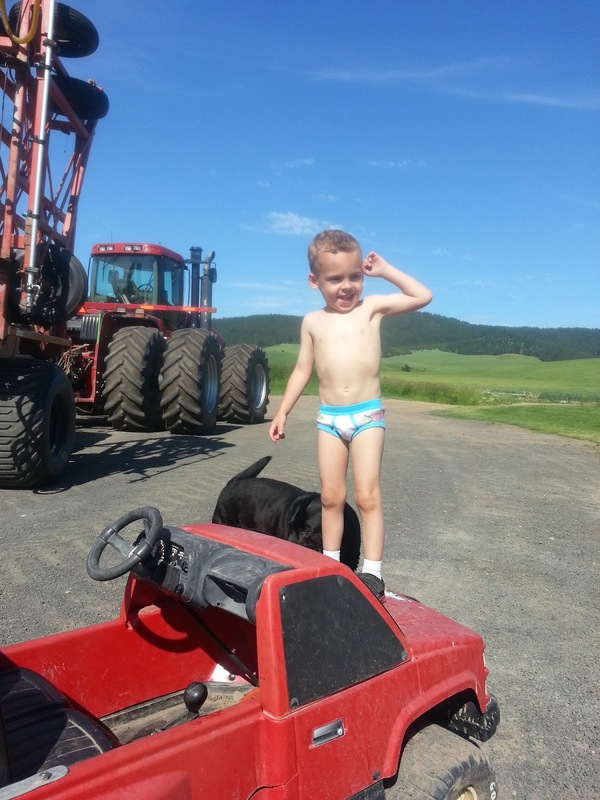 Nothing better than a boy on the farm. Did you tell me once that they lived in Wa. State? Or am I once again confused? 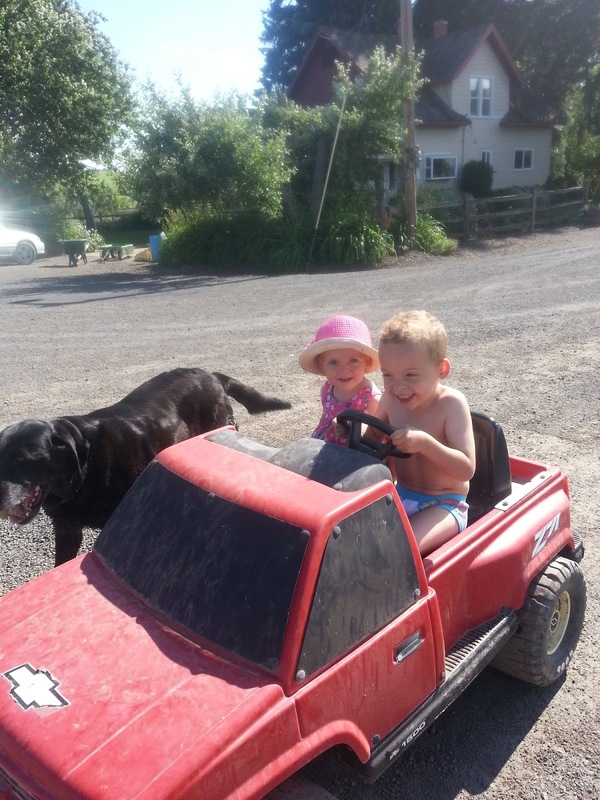 Oh the carefree days of summer, just right for the little ones to enjoy themselves. Love the pictures, especially the one of Miss Hayden in the 5 gallon container. 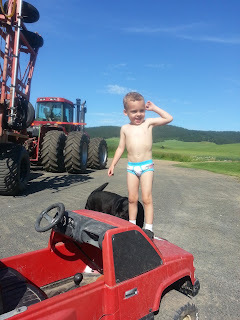 Those boys know how to have a good time, especially standing on a truck in your underoos. That's some baller stuff right there. wow that sounds like a excellent adventure for kyle. i've said it before and i'll say it again, i want you to be my dad in my next life. Looks like you had a great holiday. So relieved Mrs. Epsteen didn't make an appearance.